THE PORTS OF LOS ANGELES AND LONG BEACH, NEIGHBORS ON SAN PEDRO BAY: Los Angeles saw total volumes increase of 8.7 percent during the first five months of 2016, while in Long Beach, the year-to-date total is down 1.5 percent compared to the first five months of 2015. Cargo volumes at POLA increased 11 percent in May; at POLB, cargo rose only 0.8 percent during the month. Gene Seroka, executive director of the port of Los Angeles: We continue to explore supply chain efficiencies. They are neighbors on San Pedro Bay in southern California and together they are by far the largest port complex in the nation. 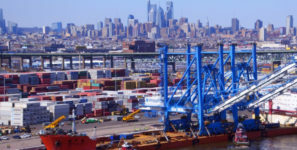 But, at least as far as May 2016 is concerned, the port of Los Angeles and the port of Long Beach are in two different places as far as their volumes of cargo are concerned. At the port of Los Angeles overall cargo volumes increased nearly 11 percent in May compared to the same period last year, marking the busiest May in the port’s 109-year history. Meanwhile, container cargo numbers improved slightly at the port of Long Beach in May, rising 0.8 percent compared to the same month last year. Los Angeles saw total volumes of 770,409 TEU, an increase of 8.7 percent, for the first five months of 2016 compared to last year. At the port of Long Beach, the year-to-date total is down 1.5 percent compared to the first five months of 2015. “The strong growth both on the import and export side is encouraging as we continue to explore ways to improve supply chain efficiencies,” said Gene Seroka, executive director of the port of Los Angeles. May loaded imports at Los Angeles increased 15 percent to 400,765 TEU while loaded exports rose 6.3 percent to 162,487 TEU. Along with a 7.1 percent rise in empty containers, overall May container volumes were 770,409 TEU. Through May, total 2016 cargo volumes in Los Agneles were 3,457,569 TEUs, an increase of 8.7 percent compared to the same period in 2015. Despite less impressive growth numbers the port of Long Beach reported that its May was the second-busiest on record with volume of 640,566 TEU. None of that explains why the port of Los Angeles did so well last month. But, then again, sometimes Long Beach is up and Los Angeles is down.